I found a verrry interesting item while reading “Jaymun’s Journey” (see: http://tinyurl.com/l5te4c Thanks, Dave! Incidentally, I am so thankful and happy that Jaymun is home now, what a relief! ), which then led me to the following abstract: http://tinyurl.com/klxuvf Wowiezeewie! In September, I will ask Sherlock if she can get me the full study…in the meantime, we will have to be content with what can be gleaned from the abstract, such as this glorious titbit: Ganoderma lucidum extract has a profound activity against leukemia, lymphoma and multiple myeloma cells and may be a novel adjunctive therapy for the treatment of hematologic malignancies. Profound effect??? That sounds super…but what is this stuff? Finally, I would like to add that 24 hours from now Stefano and I will be on a flight for the U.S. We are spending our three-week summer holiday in my home state of Massachusetts. Yaaay! I can’t wait! I will have access to my blog and e-mail account during this period (we are staying at my parents’ house, mostly), so I won’t “disappear” as I was forced to do last summer, when we went to France. But hey, after all, we will be on holiday, so I doubt I will be doing much research! A more likely scenario: Margaret (and Stefano, of course!) on a whale-watching boat or wandering through one of the Mass Audubon wildlife sanctuaries. But I will certainly stop by the blog now and again to say “hi there!” and post a few of the glorious photos that I plan to take…well, I have some packing to do, sooo…ciao for now! This morning I took on the task of going through some of my still unread (=for lack of time) e-mails, in particular, my “Science Daily” messages. So glad I did! I found one very interesting item (see http://tinyurl.com/mcac5k): a new study shows that women treating their symptoms of menopause with hormone replacement therapy could reduce their risk of developing breast cancer by taking, tadaaa!, curcumin. The researchers found that curcumin delayed the first appearance, decreased incidence and reduced multiplicity of progestin-accelerated tumors in an animal model. Curcumin also prevented the appearance of gross morphological abnormalities in the mammary glands. It did this by blocking progestin’s increased production of VEGF (aha, an old nemesis of ours pops up…). The researchers believe that curcumin and other antiangiogenic substances could decrease or delay the risk of breast cancer associated with combined hormone replacement therapy. Holy puffins! Menopause is a very complicated process…I admit to knowing very little about it, except the basics that I suppose every woman knows…but I realize that I must look more closely into this process at some point soon because I seem to have entered a premenopausal stage…even though I have had no unwelcome symptoms yet (hot flashes, e.g.). I must say, though, after reading this article, I feel much encouraged that perhaps my daily intake of curcumin will protect me in yet another way…a peachy thought! Premise: in my blog, my intention has always been to report on my own experience concerning both health issues and life in general, with some funny stuff thrown in here and there. I have always intended to do this in a straightforward and humorous manner…that’s how I am in real life, after all! And if I make a mistake, or base a post on incorrect information that I found on my own or that I received from someone else, I try to set things right as soon as possible. Well, I made a mistake in my April 16 2009 post. I meant to write a “correction” post earlier, but other things (life!) got in the way…then a blog reader reminded me of my duty just this morning. OOPS! Blog reader: I have a friend who currently has Smoldering Multiple Myeloma and has had that diagnosis for 10 years. She has been advised that according to your graph – “Figure 2. Probability of Progression to Active Multiple Myeloma…” she has a 66% probability of developing MM sometime in the future. Further, that as time passes, since the cumulative probabilities are increasing, if she makes it to 15 years, she will then have a 73% probability of progressing to MM and eventually she will have a virtually 100% chance of progression. I see the data as retrospective rather than prospective. That is, on average, 66% of people with smoldering MM already have progressed to MM after 10 years. As for those who have not progressed at 10 years (about 34% of the original group), an additional 7% in absolute terms or about 21% in relative terms (21% of 34% = 7%) will progress – thus arriving at the 73% cumulative probability at 15 years. I realize the 21% is a theoretical and imperfect estimate since it does not take into consideration many factors such as death from unrelated causes etc. However, would you say that the 66% value in your graph refers to the proportion of people who have progressed to MM at 10 years and is not an estimate of the proportion of people who will progress after 10 years? The expert: You are correct in your assumption that the 66% value refers to the proportion of people who have progressed to MM or AL amyloidosis at 10 years and is not an estimate of the proportion of patients who will progress after 10 years. As a matter of fact, the risk of progression after 10 years is approximately 1% to 2% per year. Our data indicates that the patient is at greatest risk during the first five years and then the risk decreases. As you pointed out, we are all at risk of succumbing to something as times goes on. So, the rather dismal statistics in the NEJM study refer only to those who HAVE PROGRESSED from a smoldering state to active myeloma after 10 years. It does not take into consideration those who HAVE NOT PROGRESSED. Indeed, if you have NOT progressed, your risk factor decreases with each passing year, which, by the way, coincides with my original interpretation of the study. In the study author’s own words, As a matter of fact, the risk of progression after 10 years is approximately 1% to 2% per year. Hah. “The overall risk of progression was 10% per year for the first 5 years, approximately 3% per year for the next 5 years, and 1% per year for the last 10 years.” What this means is that in year 1, 10% of the group of smolderers progressed to full MM, same in each of years 2-5. Then, after that, of those who were left in the group, in each of years 6-10, 3% of the group progressed. Next, again out of those who were left, only 1% of them progressed each year thereafter. So basically, the rule is “the longer you have been smoldering, the more successful you will be at staying in the smoldering state”, statistically speaking and in layman’s terms. You don’t accumulate [ ie. add ] the percentages as you go along. For example, if you make it as far as year 6, then your chances of progressing during year 7 are 3%. Okay, so, having SMM does not mean that some day you will inevitably progress to active myeloma. Some of us will, some of us won’t. Great. Another promising substance just joined my to-be-tested list…! One of my fellow myeloma bloggers did a really sweet thing for me and two other bloggers (see: http://lacootina.blogspot.com/2009/07/in-good-company.html): he honored us at a “Relay for Life” event. These, he explained to me, are community based events to raise money for the American Cancer Society. It is a 24 hour event, so families bring tents and kids and organize teams. There’s music, games, etc. There must be a team member walking all the time, you sign up for hour or so shifts including through the wee hours of the morning. 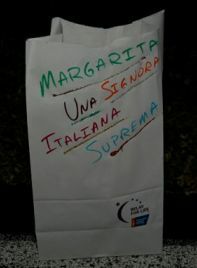 The bags are honoring survivors or in memory of those who died of cancer. There is a candle inside that is lit after dark and burns all night long. The track where everyone is walking is illuminated by thousands of these decorated bags. Inside there is a can of food, which is later donated to a local relief agency. But I plan to post about the full nail fungus treatment study in the next few days…I am going through it right now, in my snippets of time. In the meanwhile, I hope you will enjoy this image of a puffin carrying some sand eels back to its burrow, a rather blurry photo taken by yours truly on Skomer Island on July 5th. “Lovers of the English language might enjoy this. It is yet another example of why people learning English have trouble with the language. There is a two-letter word in English that perhaps has more meanings than any other two-letter word, and that word is ‘UP.’ It is listed in the dictionary as being used as an [adv], [prep], [adj], [n] or [v]. It’s easy to understand UP, meaning toward the sky or at the top of the list, but when we awaken in the morning, why do we wake UP? At a meeting, why does a topic come UP? Why do we speak UP, and why are the officers UP for election and why is it UP to the secretary to write UP a report? We call UP our friends and we use it to brighten UP a room, polish UP the silver, we warm UP the leftovers and clean UP the kitchen. We lock UP the house and some guys fix UP the old car. At other times the little word has a really special meaning. People stir UP trouble, line UP for tickets, work UP an appetite, and think UP excuses. To be dressed is one thing, but to be dressed UP is special. We open UP a store in the morning but we close it UP at night. We seem to be pretty mixed UP…about UP! To be knowledgeable about the proper uses of UP , look the word UP in the dictionary. In a desk-sized dictionary, it takes UP almost 1/4 of the page and can add UP to about thirty definitions. When it threatens to rain, we say it is clouding UP. When the sun comes out, we say it is clearing UP. When it rains, it wets UP the earth. When it does not rain for awhile, things dry UP. One could go on & on, but I’ll wrap it UP, for now….my time is UP, so…time to shut UP!